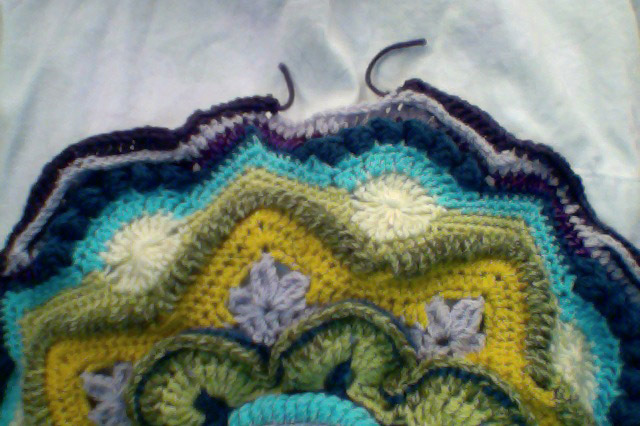 There will definitely be crochet showing up on this blog as I’ve become just a little obsessed by it. I love the fact that it can be a repetitive, very mindful process when there is a simple stitch or pattern repeat. Other times it can be a feat of crochet hook gymnastics to make complex stitches and it exercises a part of my brain that has been dormant since maths O’ Level because there’s LOTS of counting! 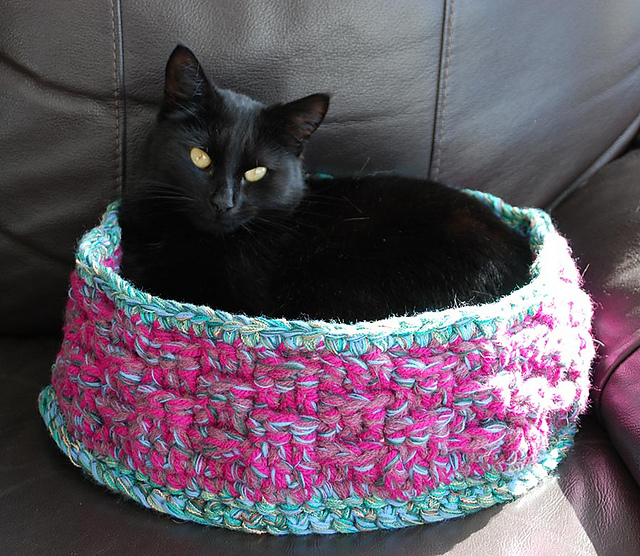 I made some cat baskets last year which Trillian instantly took to. 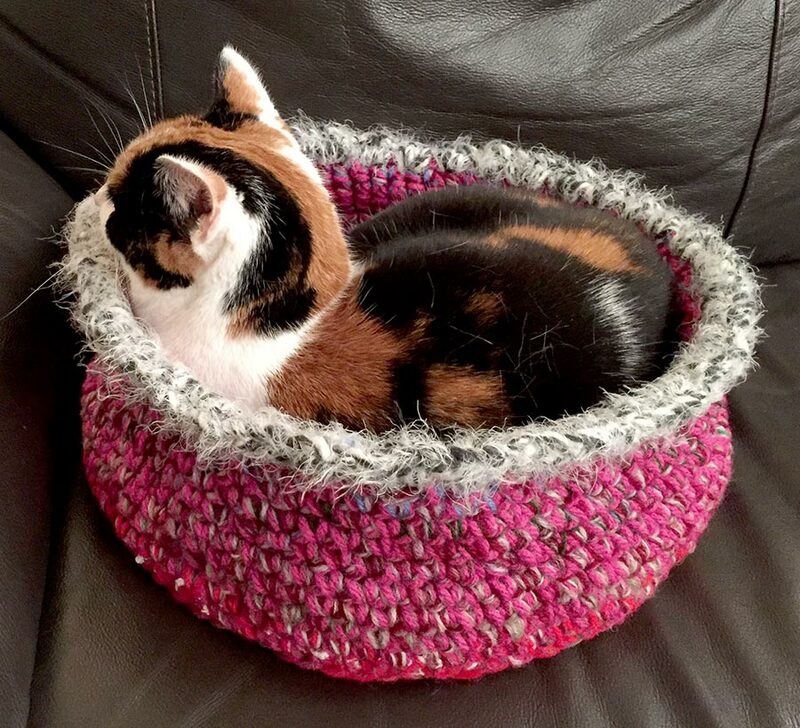 Trillian’s basket was made with bits and pieces of old yarn I had lying around, working with several strands to make a thick chunky yarn. Purdy’s was a bit more adventurous – my sister rescued a load of cones of fine machine knitting yarn from a skip a few years ago, so I thought I’d have a go using multiple strands to get the thickness I wanted. I ended up using 24 strands which was rather challenging! 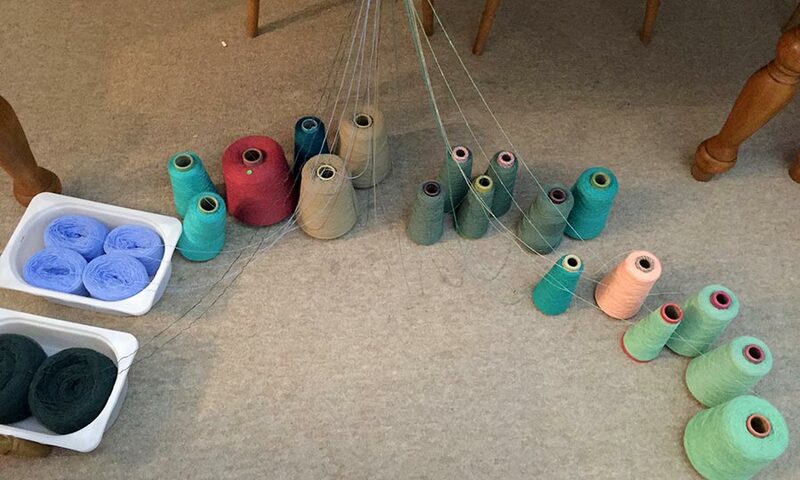 I discovered that doing it like that makes a lovely thick yarn with a fantastic mix of colours, but because they are not twisted together, it is not firm enough to make baskets, it’s just too floppy. 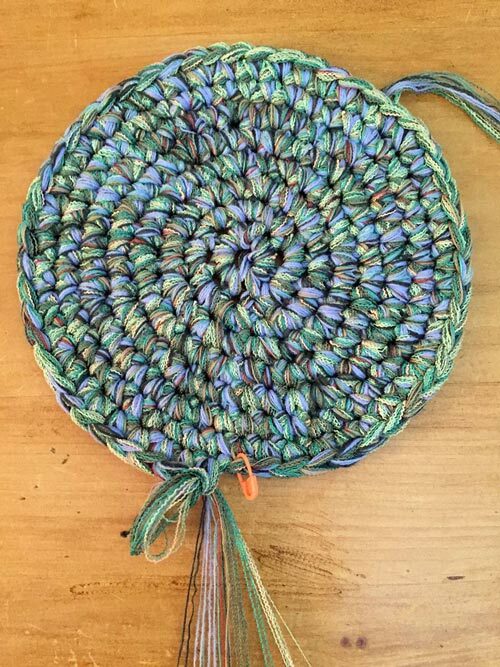 As you can see in the picture, I used it for the base, but reverted back to a chunky mix for the sides and also used a basketweave stitch to make it sturdier. 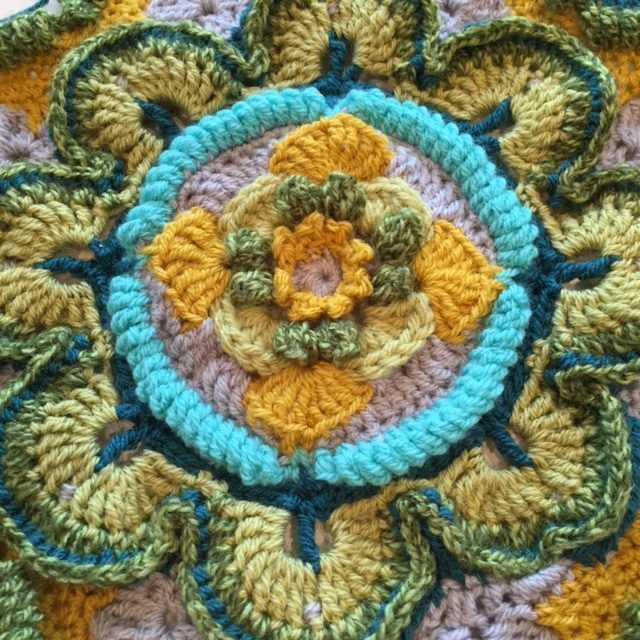 I’m currently making a rather complex blanket from a free pattern I found online called Mandala Madness. 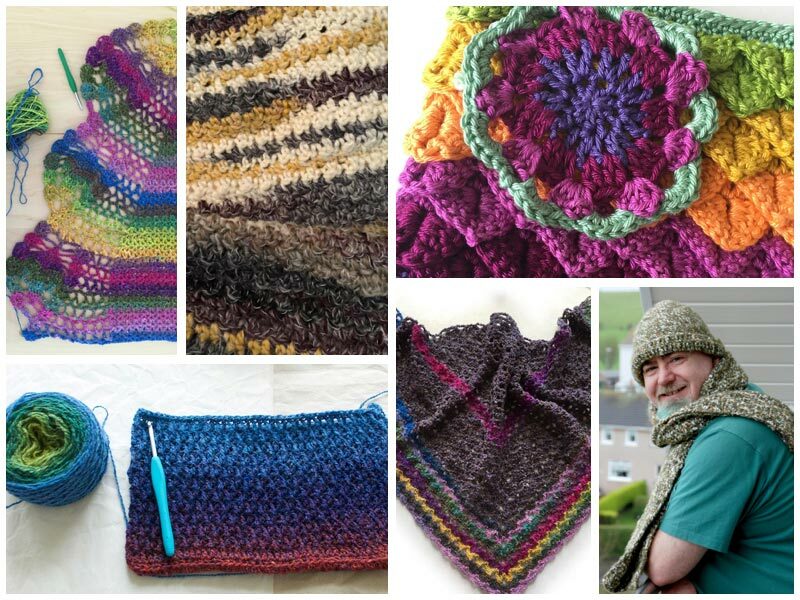 If you love knitting, crochet, spinning or other yarn related stuff, then I’m sure you’ve heard of Ravelry.com – a brilliant website for connecting the yarn obsessed, finding patterns and tons of inspiration. You can find me there and check out more of my projects at ravelry.com/projects/glendaww. Enjoying your blog site also. Thanks Teresa, they were ignored for quite a while, so I nested one inside the other and Purdy loves that, so they’re both hers now! Thanks Jackie, I just wish the cats didn’t get bored so quickly. The cat baskets just get ignored now, sigh! 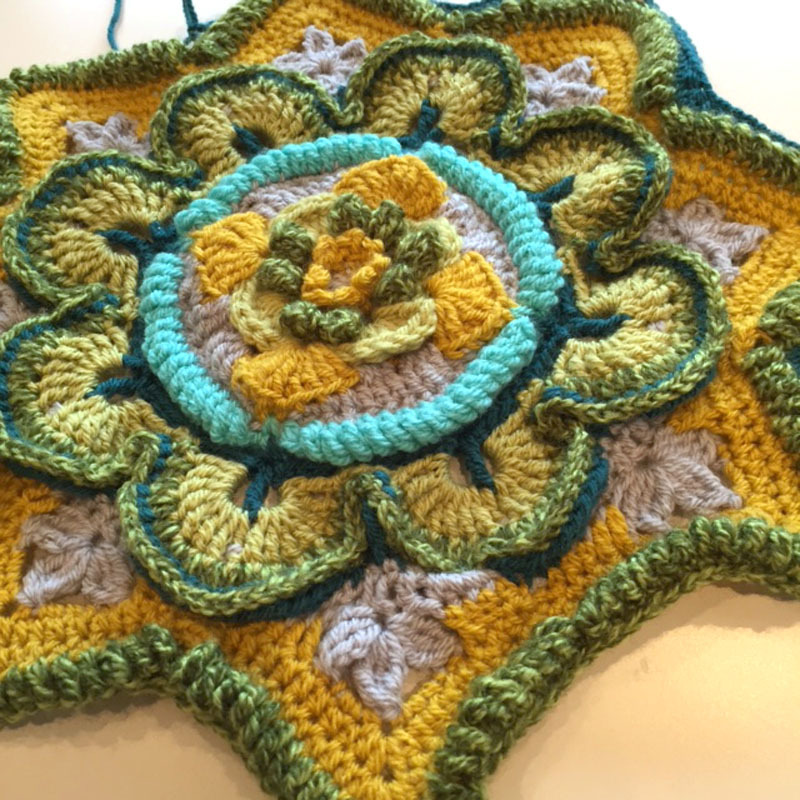 Thanks Carol, that moorland blanket looks gorgeous and uses the same yarn that I’m using for my mandala madness blanket. I think I have most of the colours she used as well, so when I’m done, I may use that stitch to make a cushion or two to go with my blanket!